Baked Moong dal Pakora with tomato salsa and roasted tomato salad is giving a fantastic flavor on your snack. It will definitely make your snack time. Roasted tomato has its own flavour as well as the moong dal. So, try this delicious recipe at home. 1. Soak the dal in water for about 2-3 hours. 2. Drain the water and refrigerate it overnight without the water.If you want make the pakora on the same day, you can skip this step too. 3. Now put the dal on the mixer and grind it lightly so that some of the dal ground finely and some of it remains partial. 4. Now take a bowl, add the dal. Add grren chilies, garlic ginger paste, cumin seeds paste, coriander powder, onions, salt and chopped coriander leaves. Mix it well. 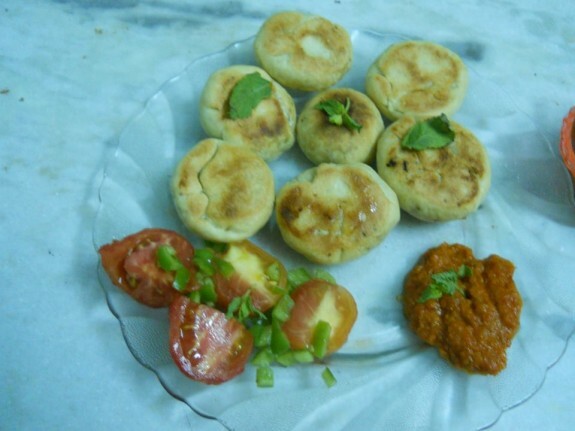 Dvide it equally and give a pakora shape with ½ of height of muffins mould of your oven. 5. Preheat the oven in 375 degree F and grease the muffin pan moulds with little oil. 6. Slowly place the dal pakora in the muffin moulds and pour ½ tsp of oil in each mould so that it will not become too dry while baking. 7. Now, place the oven and bake it for 20 minutes while turning to the other side too. 8. Make sure that the inside of the pakora is properly baked and it turns in light golden colour. 9. Place this with roasted tomato salad and tomato salsa. 1. Roast the 2 tomatos and capsicum in gas oven directly. 2. In a small pan lightly roast the garlic cloves. 3. Now ct the tomatoes in 4 pieces each. Also finely chopped the capsicum and garlic cloves. 4. In a bowl mix roasted tomatoes, chopped capsicum, chopped/minced garlic, oregano, black pepper, salt, balsamic vinegar and extra virgin olive oil. Toss everything. 5. Your roasted tomato salad is ready to eat. 1. Pre heat the oven. 2. Place the tomato halves skin side up on the baking sheet. Spread the garlic, onion and green chilies chopped around the tomatoes. Broil until the tomato skins start to blacken and blister. 3. Now transfer all the vegetables in a mixer with some salt and red chili flakes to make a smooth puree. Transfer it in a bowl and let it cool in room temperature. 4. Now add chopped coriander leaves, lime juice and stir it. Tomato salsa is ready. You can refrigerate it in a tight lid container for up to 4 days.